The Chaos war is over, magic has gone away... or has it? The gods have vanished, and magic wanes from Krynn. It is the Age of Mortals, but also the Age of Dragons, more massive and powerful than any seen before. 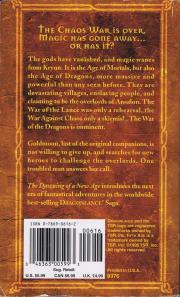 They are devastating villages, enslaving people, and claiming to be the overlords of Ansalon. The War of the Lance was only a rehearsal, the War Agains Chaos only a skirmish. The War of the Dragons is imminent. Goldmoon, last of the original companions, is not willing to give up, and searches for new heroes to challenge the overlords. One troubled man answers her call. 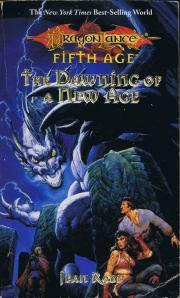 < The Dawning of a New Age introduces the next era of fantastical adventures in the worldwide best-selling Dragonlance Saga.